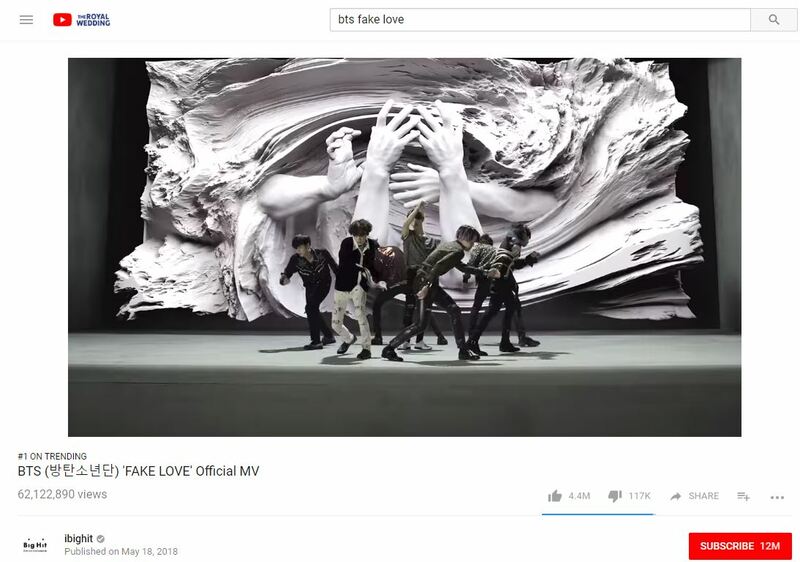 BTS’ “Fake Love” has received over 62.7 million YouTube views. On May 20, it reached the peak position of #1 on YouTube Trending. In 48 hours, BTS’ “Fake Love” received 62.7M YouTube views. “Fake Love” is upbeat, and the official MV video tells an intense story of heartbreak while incorporating special effects and art. At 3:12, the video transitions to a relaxing scene with a water fountain and creative special effects. This video displays high-energy choreography, and a demolition special effect. BTS will perform “Fake Love” at the 2018 Billboard Music Awards, which airs on May 20. The K-Pop group is also nominated for the Top Social Artist Award. BTS is making history as the first K-pop artist to perform at NBC’s Billboard Music Awards. The 2018 Billboard Music Awards is set to air May 20 at 8 ET/ 5 PT. Kelly Clarkson will host the three-hour telecast. Click here to watch the BBMAs preview.